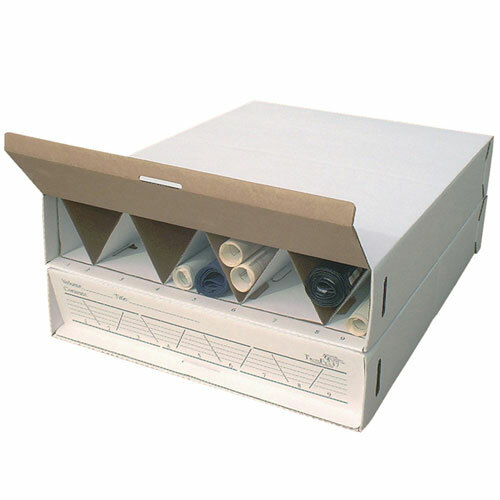 The TrussFile is a modular stackable document roll storage solution. The economical solution for stacked rolled storage. An excellent system for active or permanent storage of blueprints, drawings, maps, x-rays, and large rolled document. Corrugated cardboard has exceptional stacking strength with trussed interior. Modular design also allows easy relocation in office, vertical use, or use in a vehicle. Labeled end flap allows identification and convenient access when stacked. Shipped two TrussFiles per carton for a total of 18 compartments. Shipped Flat and minor assembly is required. The TrussFiles are displayed stacked, but are not connected. Each TrussFile has 7 large compartments and 2 smaller compartments. Outside Dimensions: 6.5"H x 29"W x 39"D per unit.